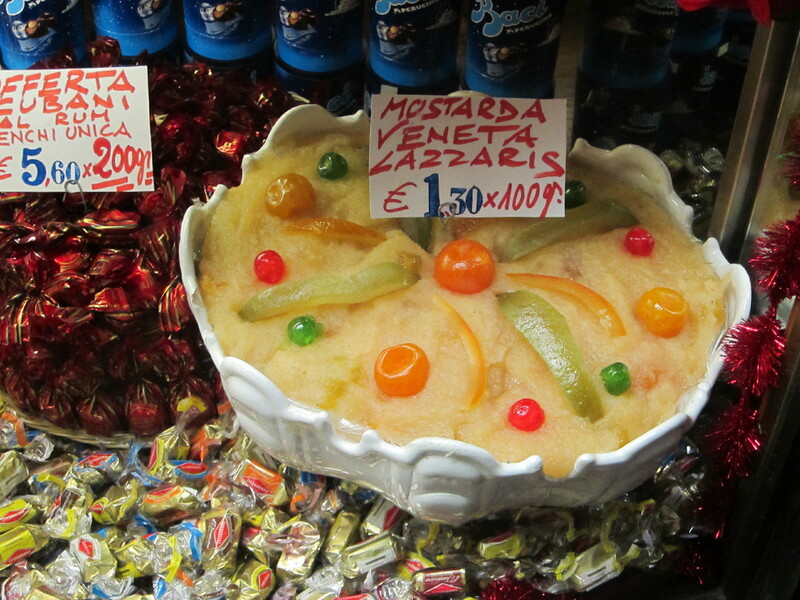 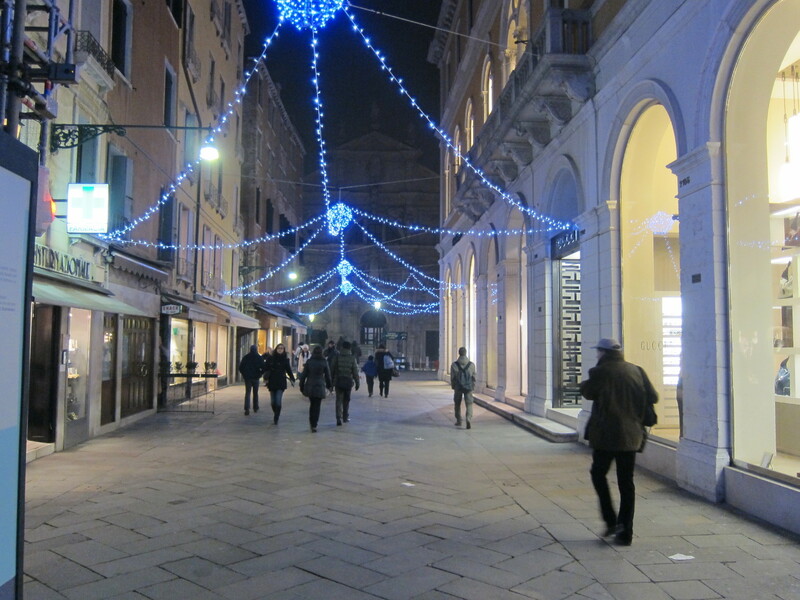 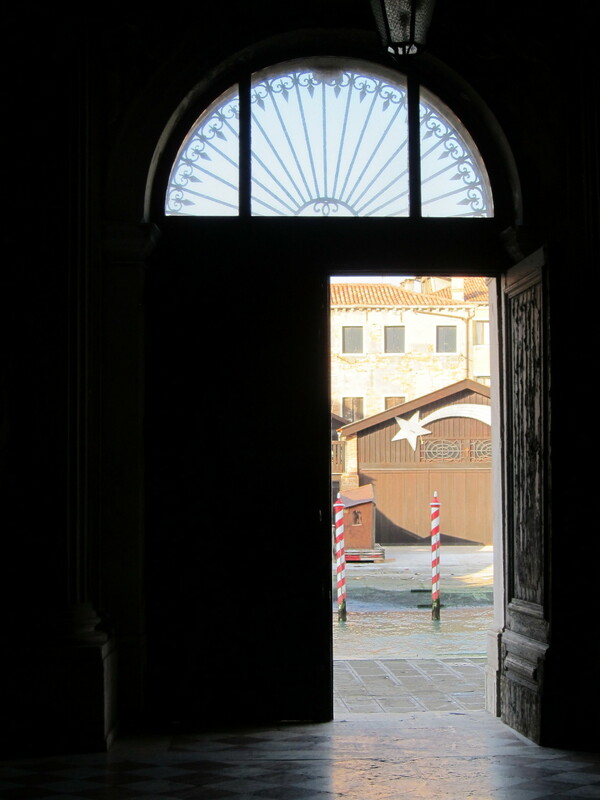 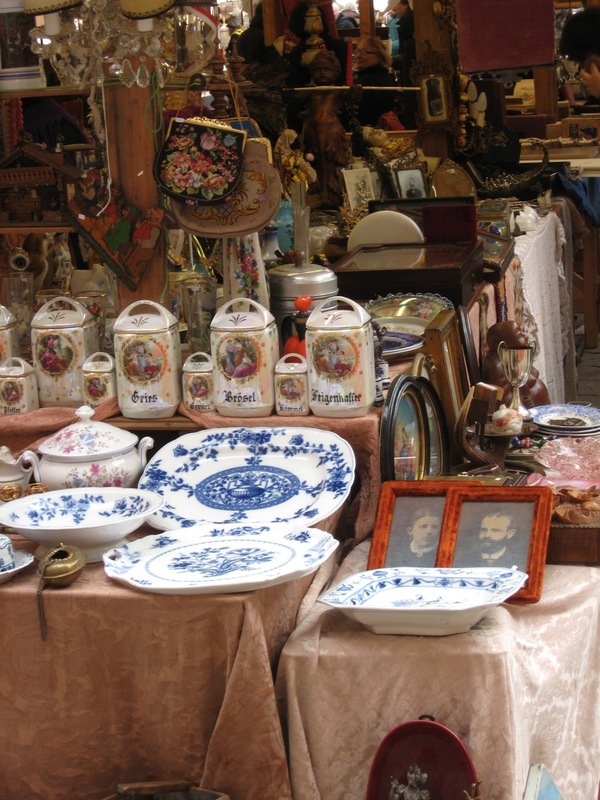 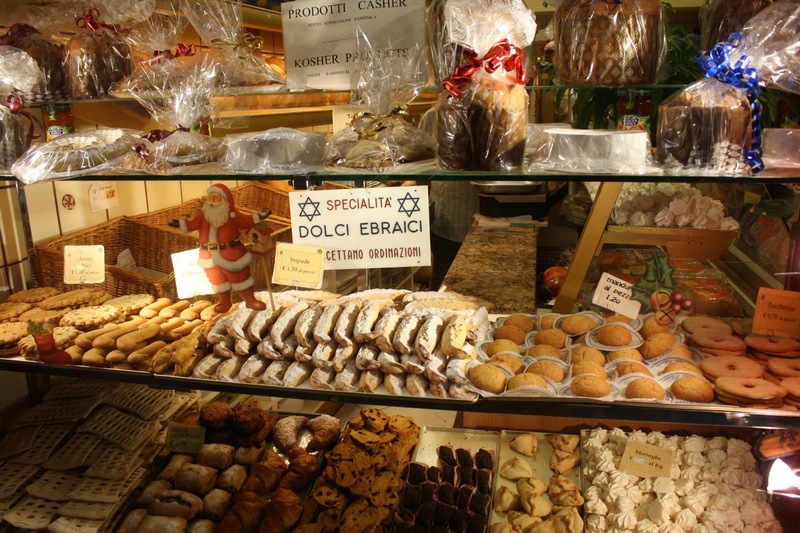 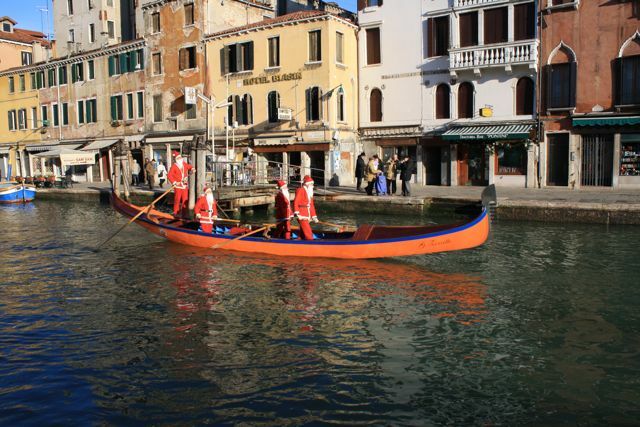 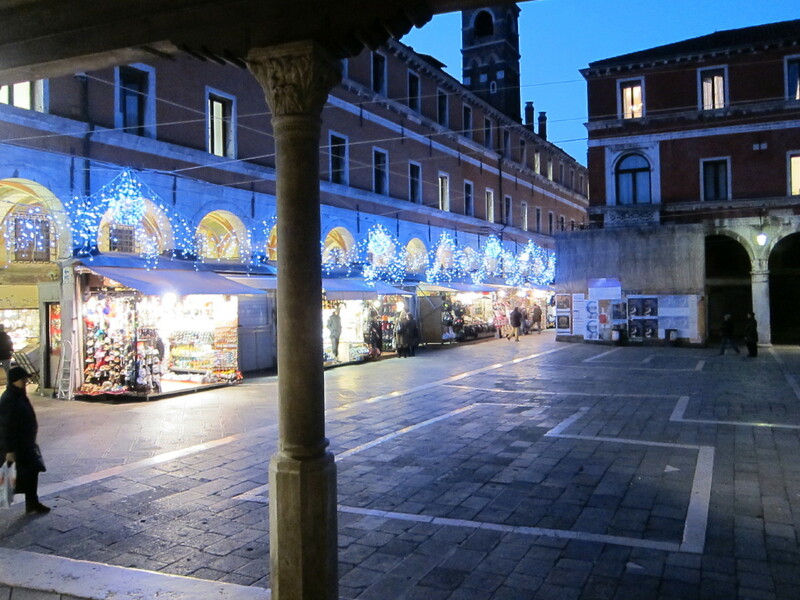 True to its authentic nature, Christmas is not a big commercial event in Venice. 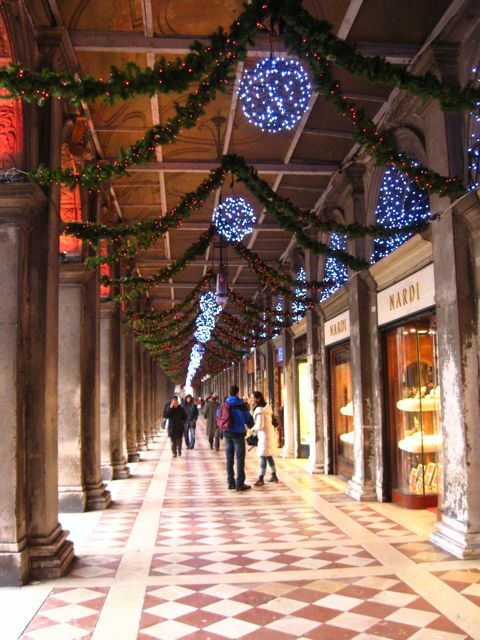 Typical Christmas decorations, lights, garlands and trees are confined to the busiest parts of the city: the Merceria, the Rialto, San Marco. 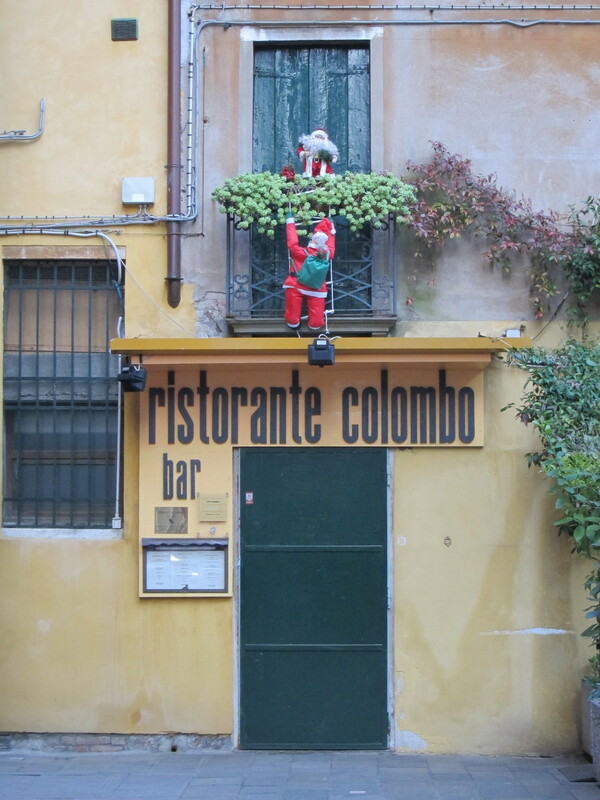 Occasionally, one can see a window or a balcony timidly decorated. 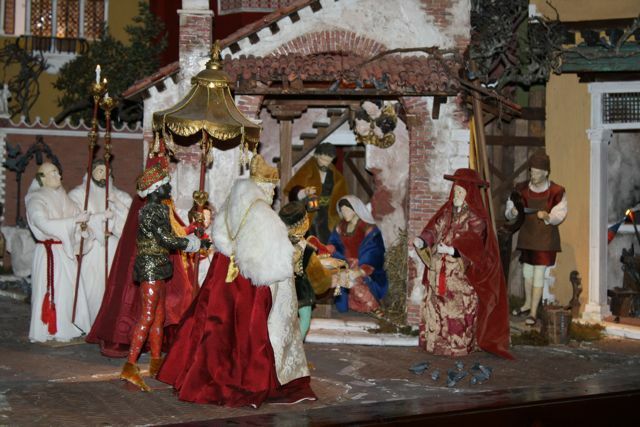 Nativity scenes, or presepi, on the other hand, are much more dear to the Italians, who are credited with their creation. 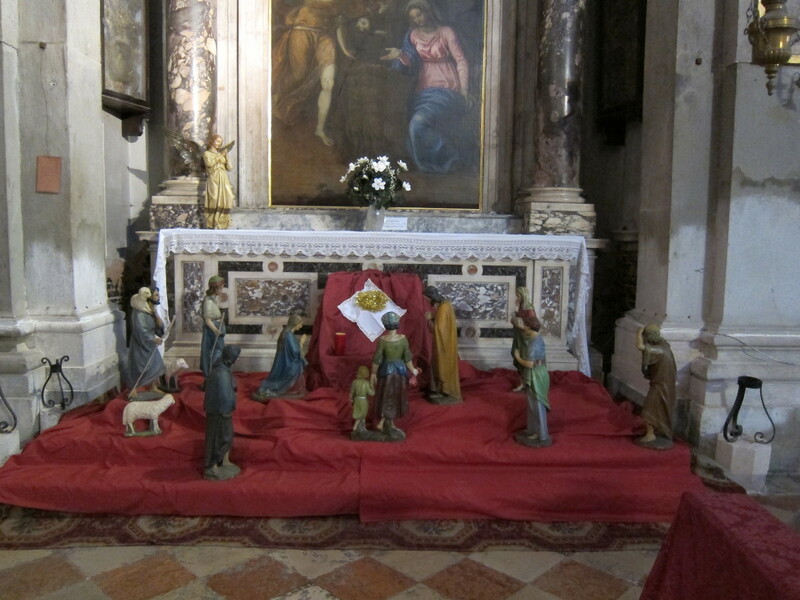 The first Nativity scene is said to have been the work of Saint Francis. 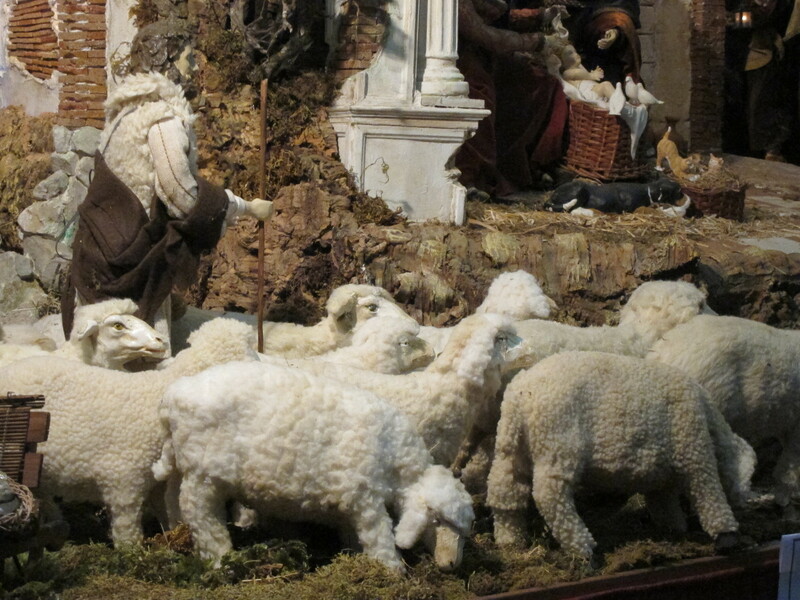 It was a living one and took place in 1223 in Greccio, a small town south of Assisi. 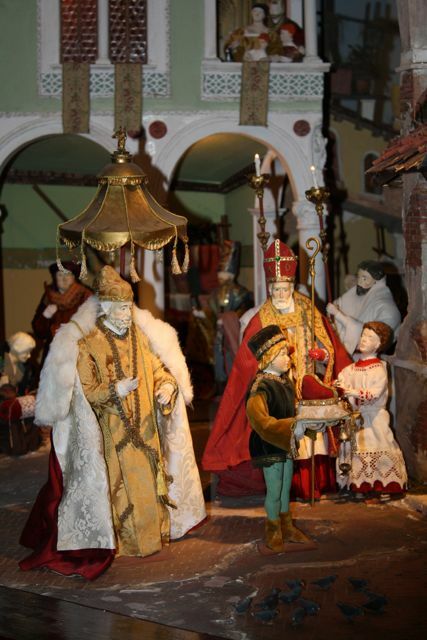 Christmas trees, Germanic in origin, came to Italy, and to the rest of the world, via England and the United States and much later than the presepe. 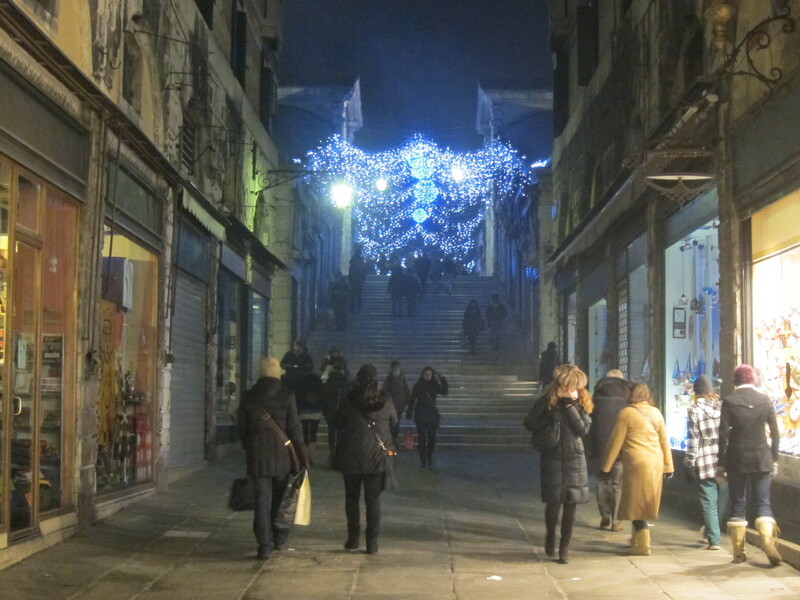 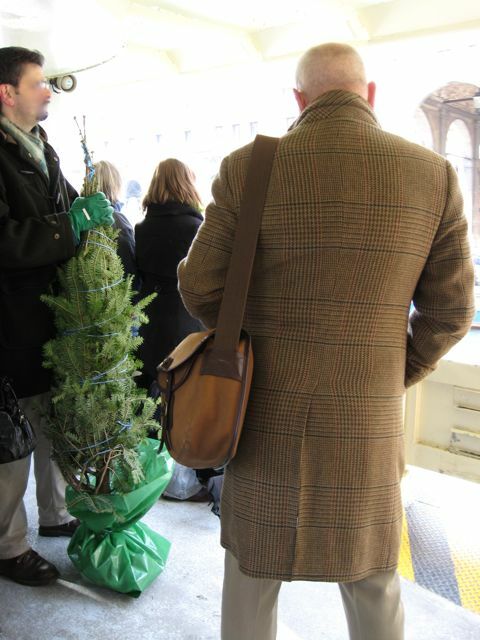 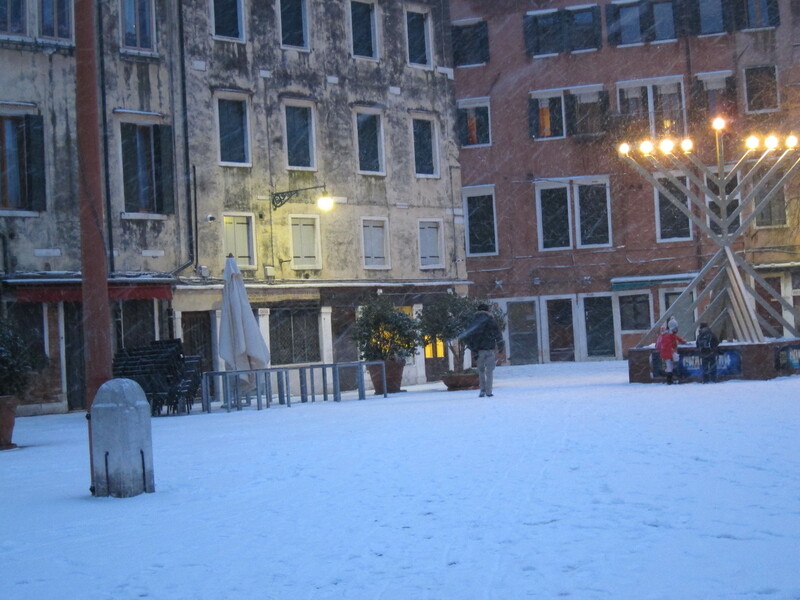 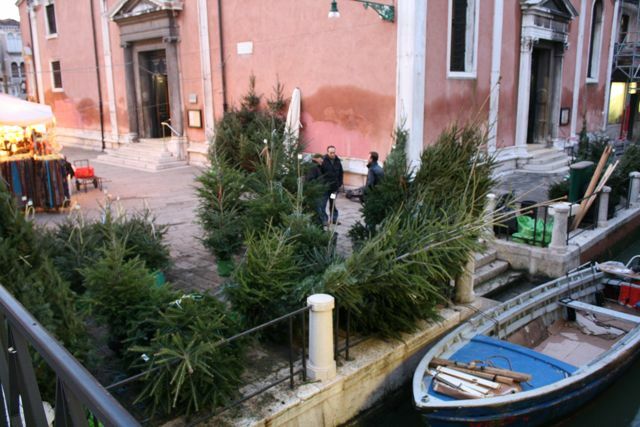 You can find Christmas trees in Venice, even natural ones, but only rarely in public areas. 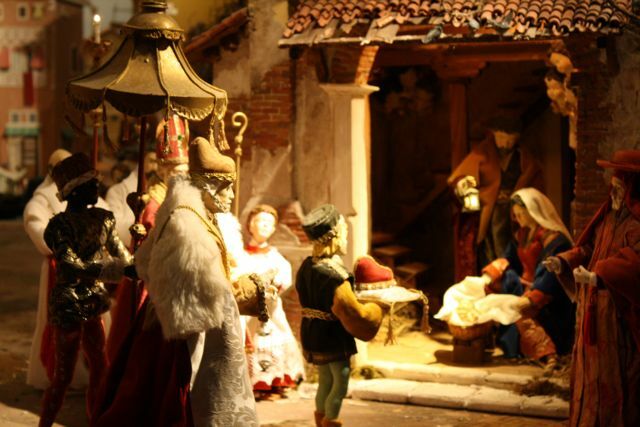 The church of the Madalena in Cannaregio every other year around Christmas showcases a beautiful collection of presepi, featuring the works of local and international artists. 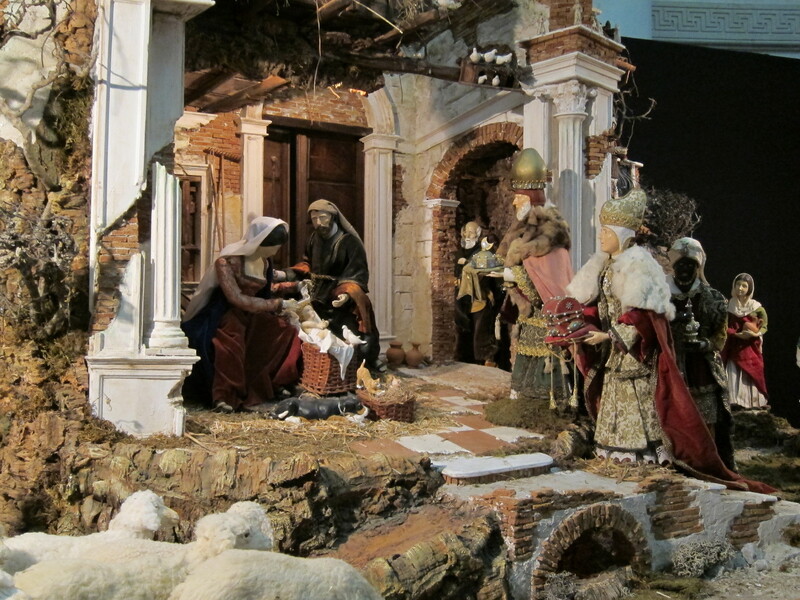 Also the work of Luciano Soleni, this presepe below has a Venetian theme as well. 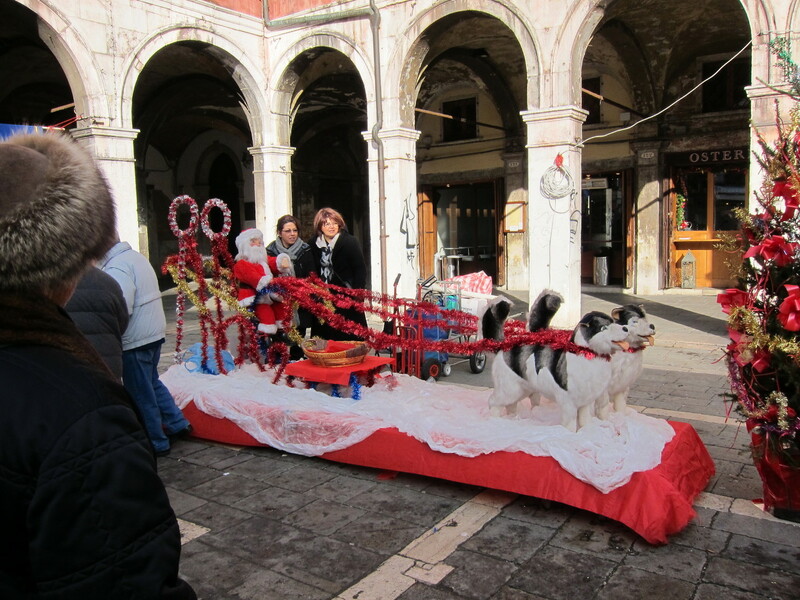 Again the Doge is one of the Wise Men and one of the gifts for the Baby is a corno. 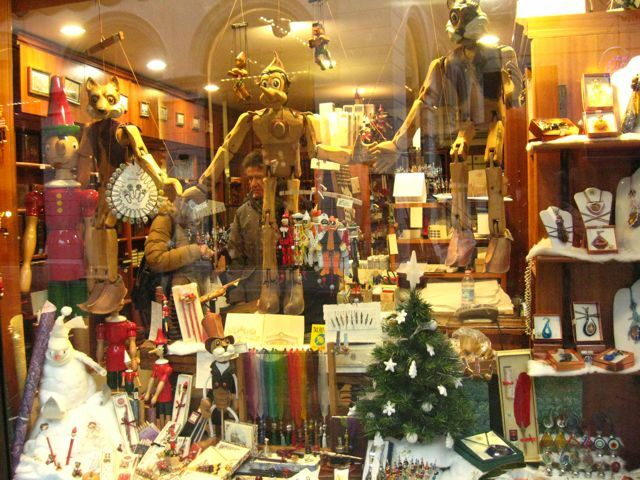 Notice the pigeons, the mask shop, the women making lace... and the cat again stretching his back. 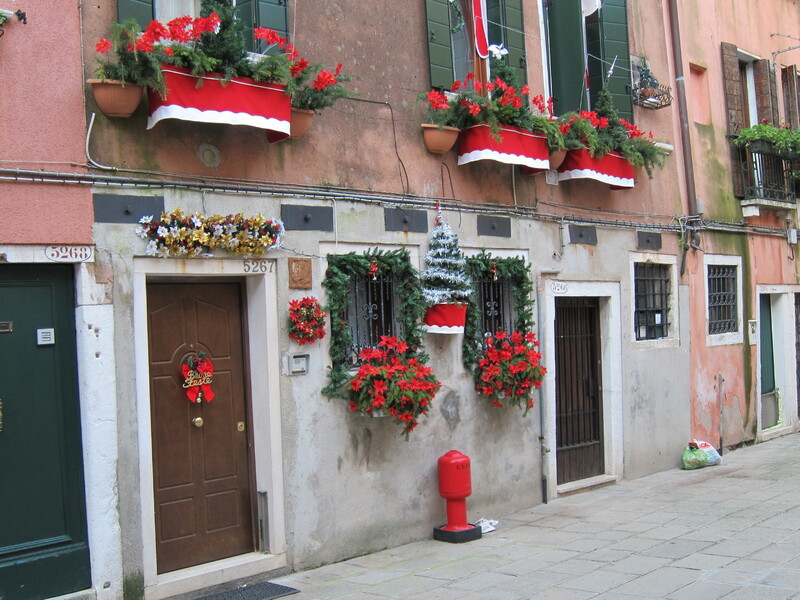 The making of a forcola, the laundry hanging from long poles, a corner that evokes the garden of Palazzo Van Axel in Cannaregio, they all frame the charming Nativity scene. 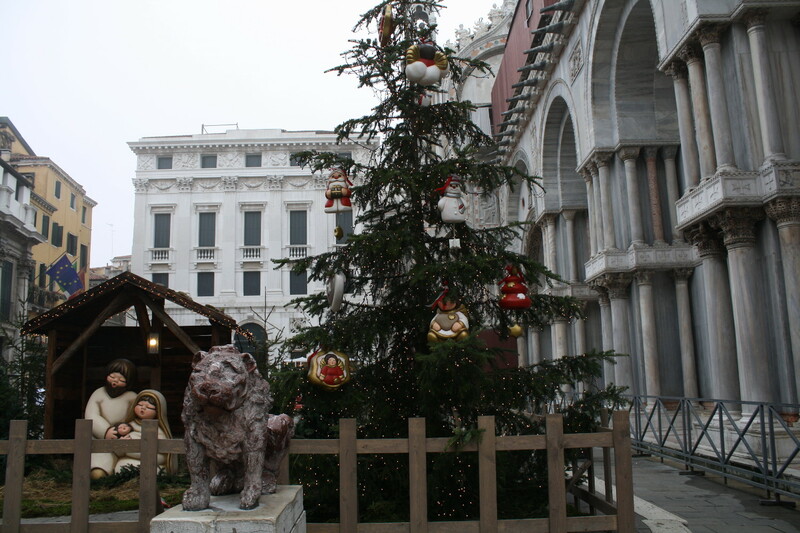 The Patriarch of Venice is also one of the Wise Men. 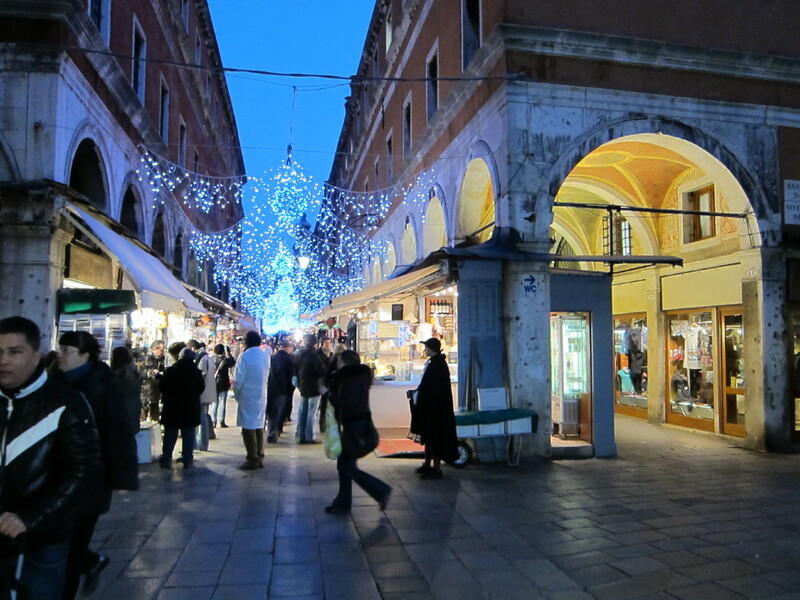 The birth takes place in San Polo, in the Rialto, where according to tradition Venice was founded. 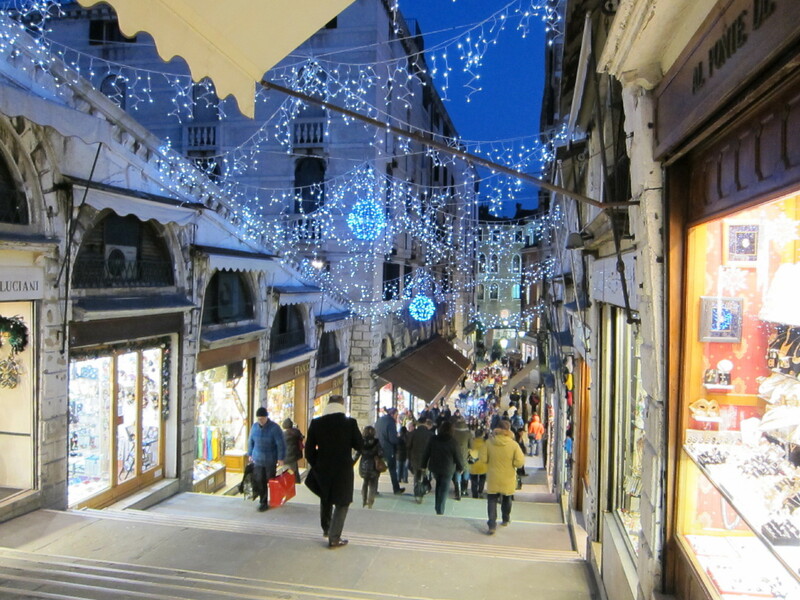 The Rialto Bridge and the "paron de casa" couldn't be absent. 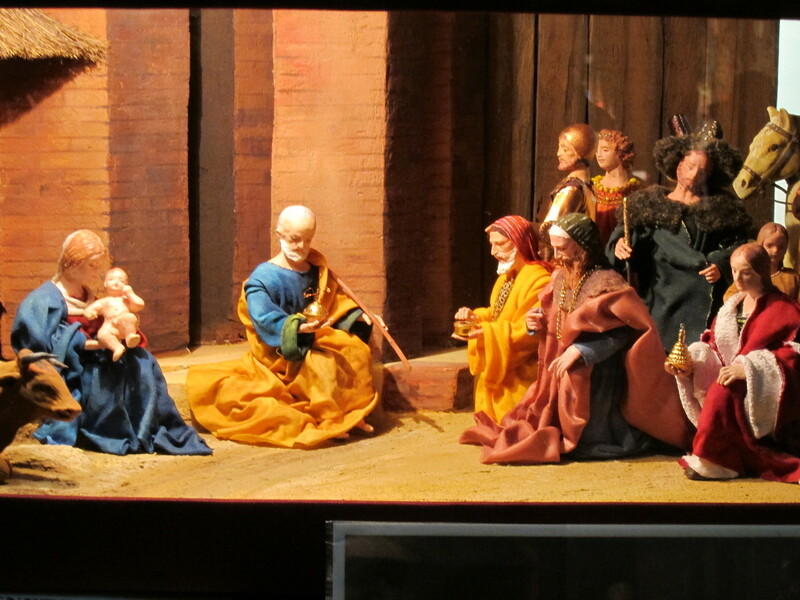 This presepe by Vincenzo is from Napoli. 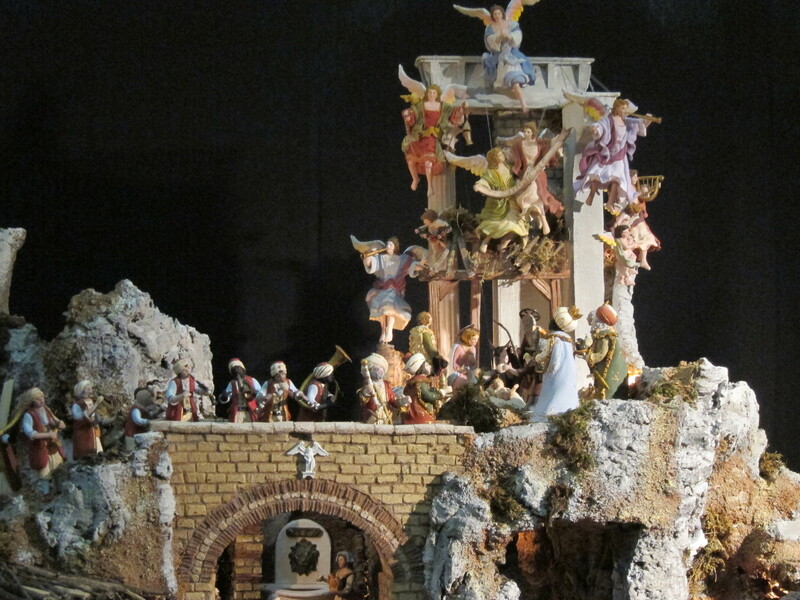 Musicians celebrate the holy birth and dazzling Neapolitan angels hover above the crib. 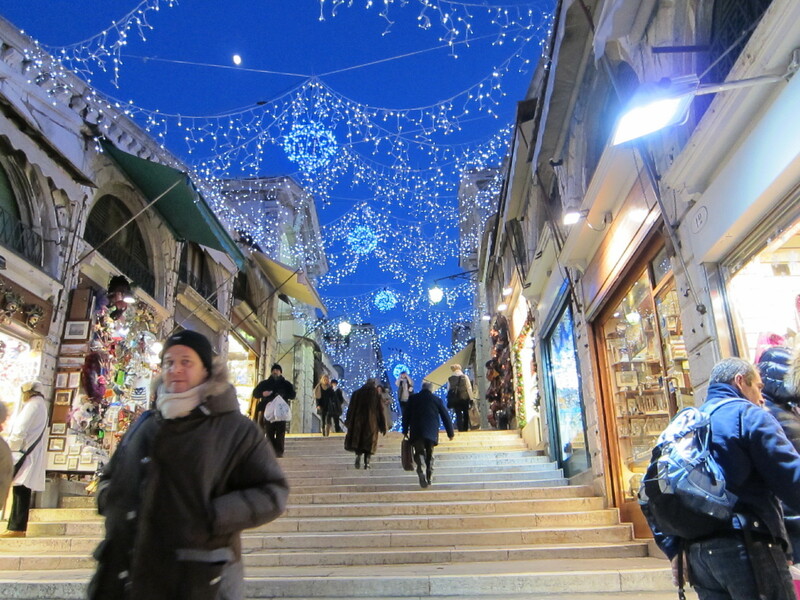 A glittering Polish scene by artist Piotr Michalczyk mingles with the Italian presepi. 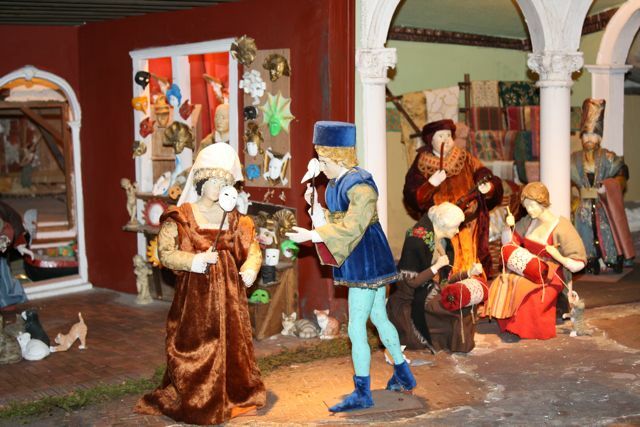 These traditional folk scenes from Poland are known as Szopka Krakowska. 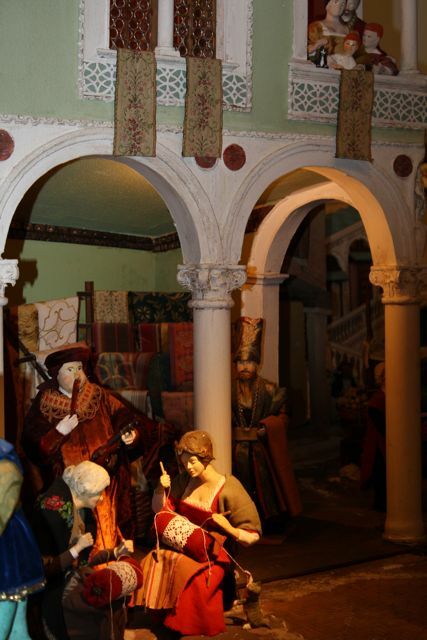 A very special Nativity scene is this beautiful homage to Giorgione in the 500th anniversary of his death. 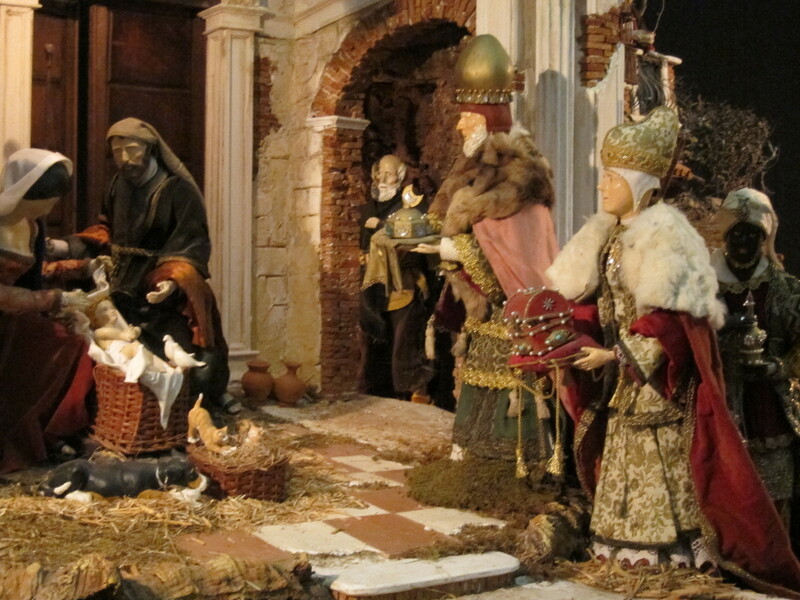 It's a moving recreation of his Adoration of the Magi (now in the National Gallery, London). 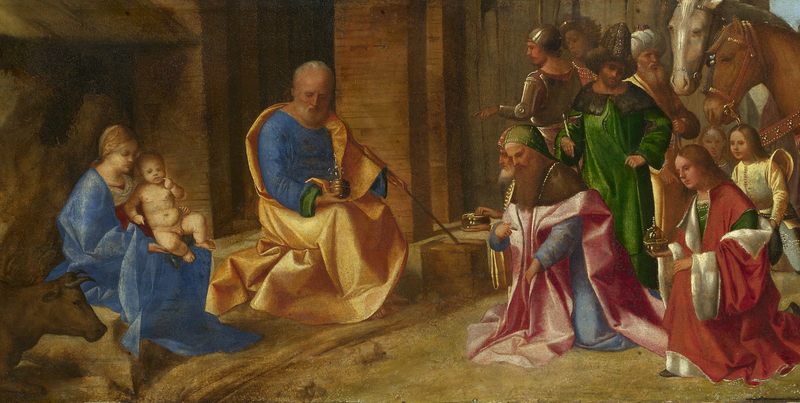 The scene is the work of artist Alfonso Pozzobon, who like Giorgione is from the Castelfranco area. 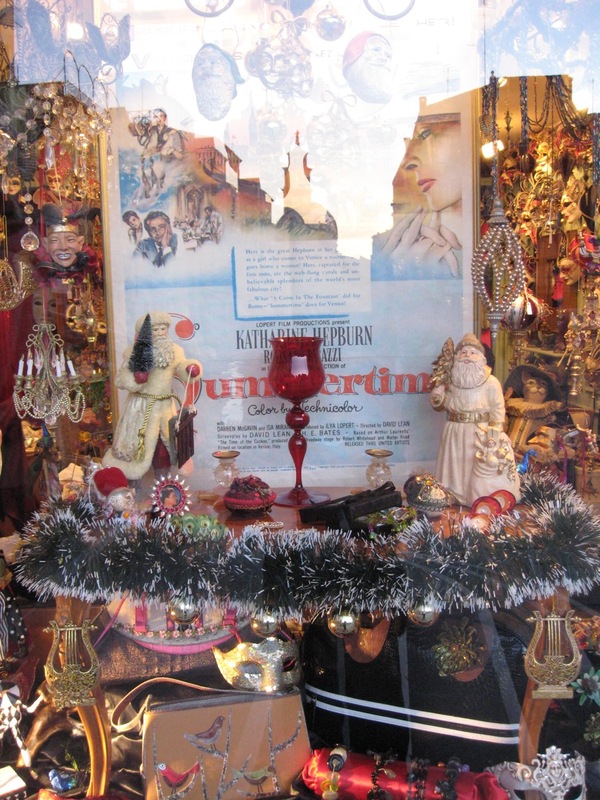 A different Christmas display is in the window of the Hotel Montecarlo (Calle dei Spechieri, San Marco 463). 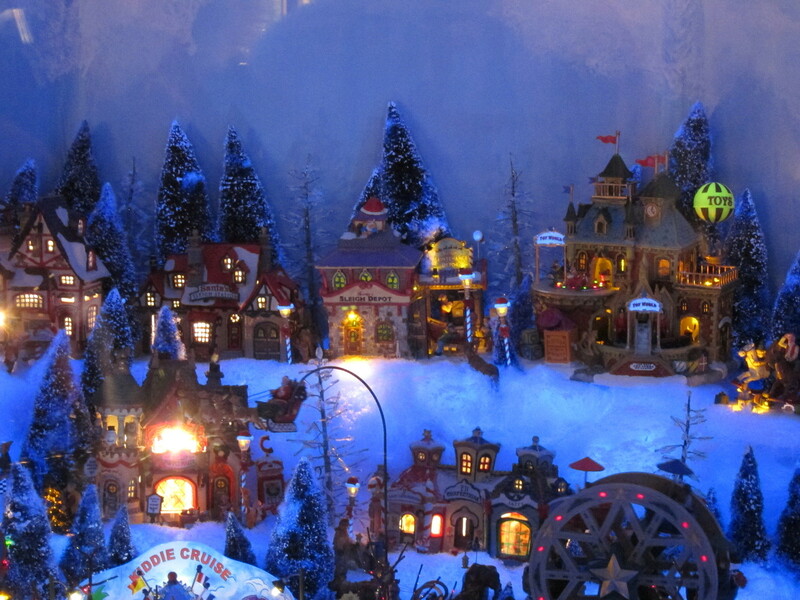 It has a typical winter village scene, American style, with flying Santas, a Santa in a swinging hammock (in the snow! 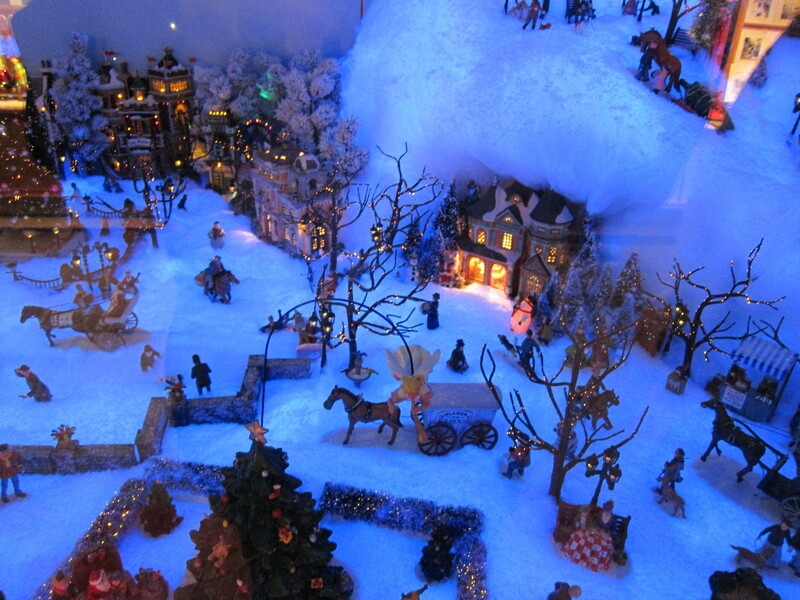 ), ice-skaters, ski lifts, scintillating stars and music. 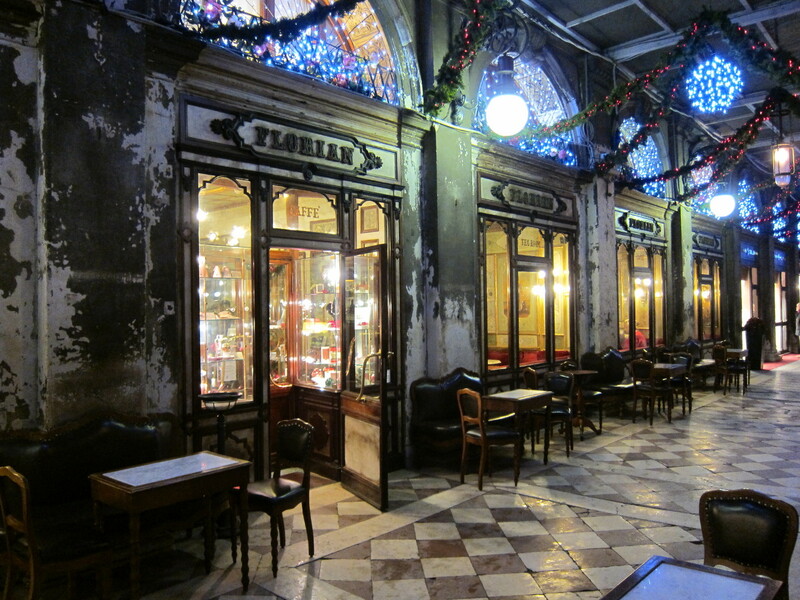 You can easily spend a whole evening discovering its hidden treasures. 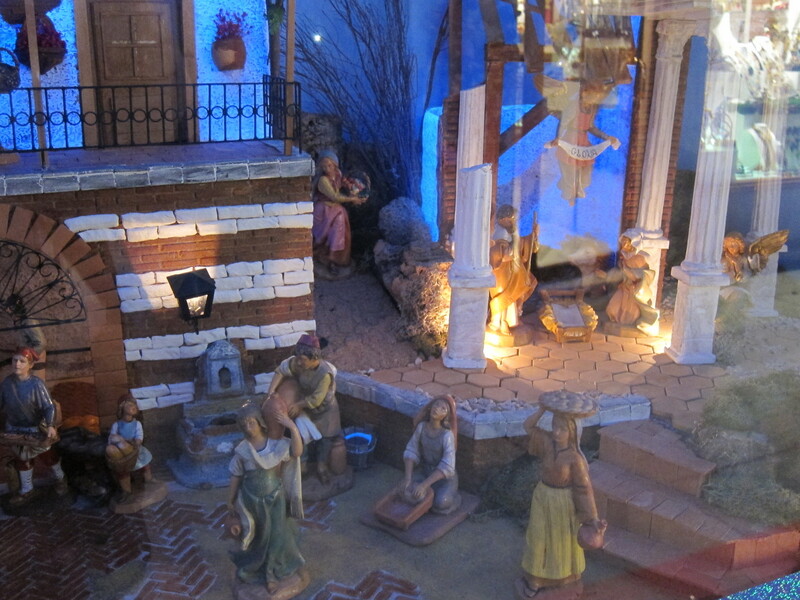 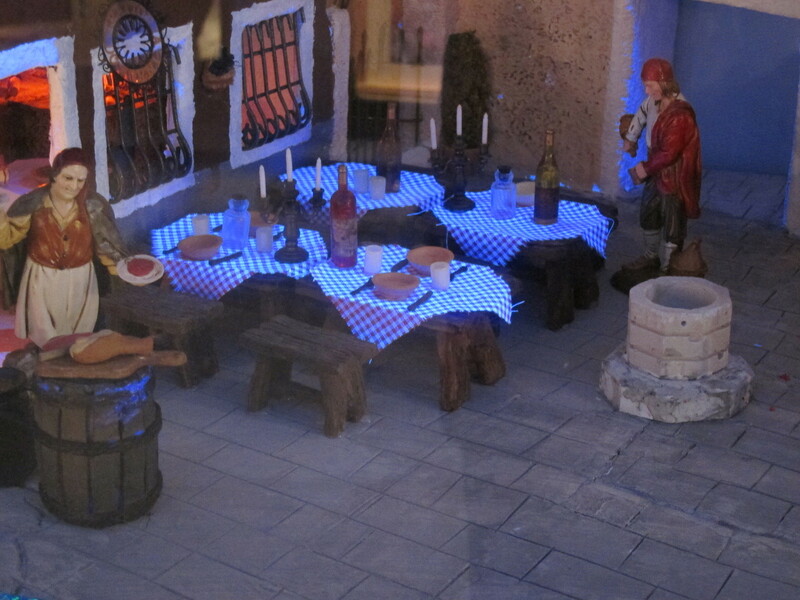 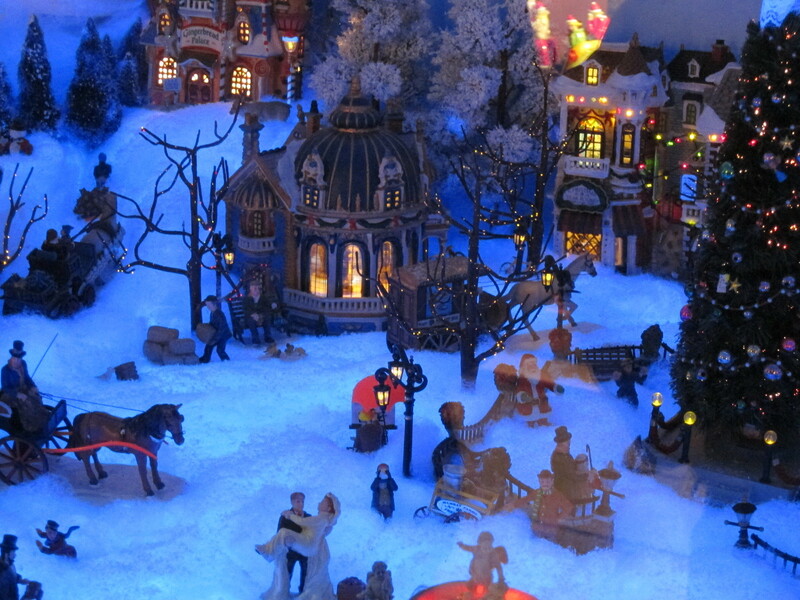 In the next window there is a traditional Italian presepe set in a cityscape that could well be Venice. 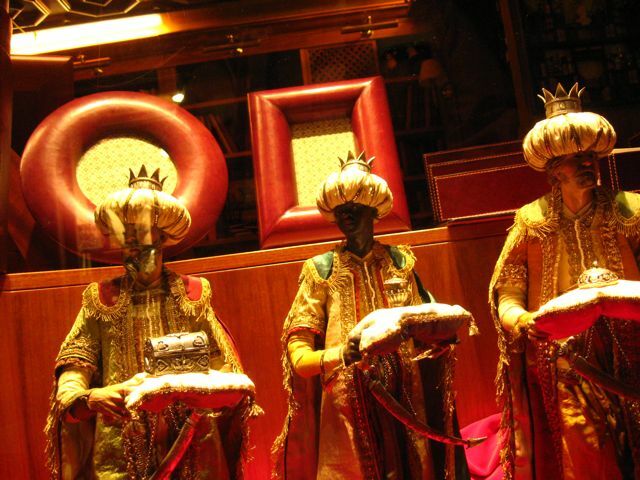 Unfortunately, they were not on display in 2011. 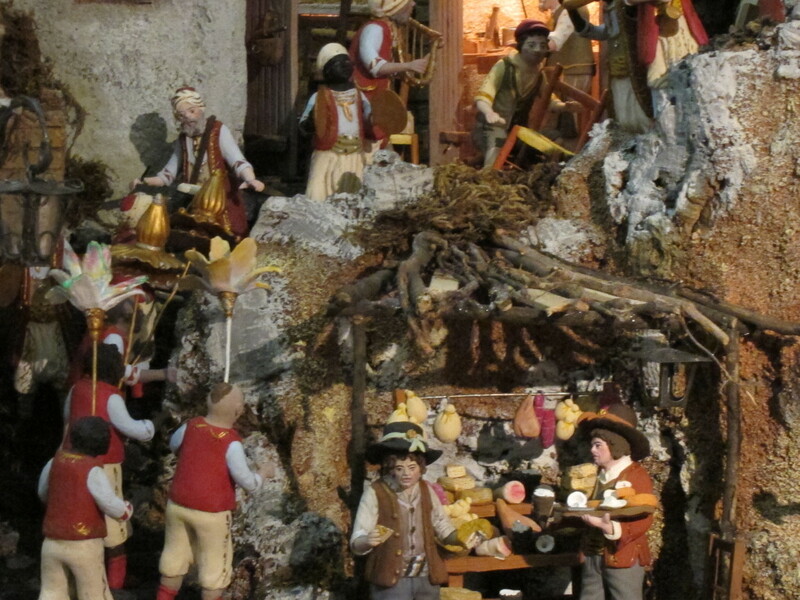 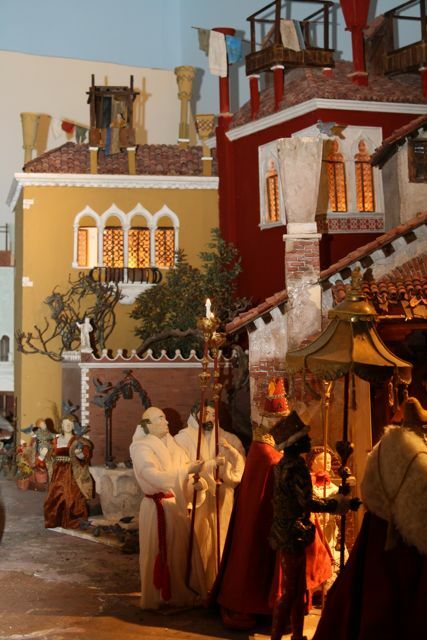 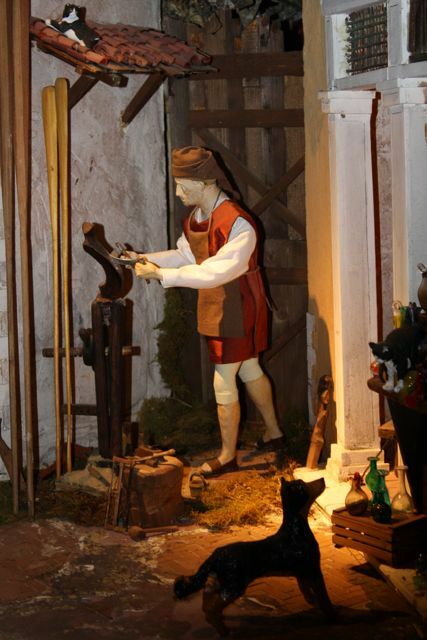 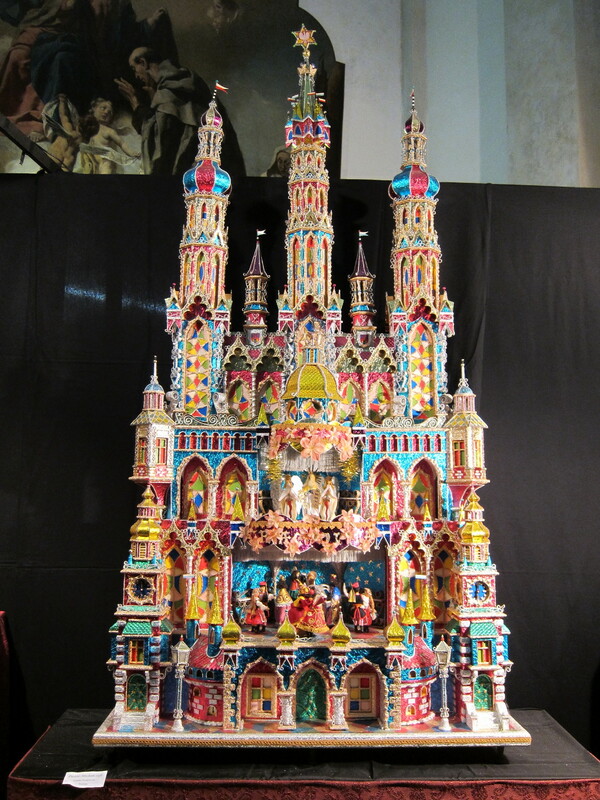 In most churches in Italy the presepe is not shown until Christmas eve. 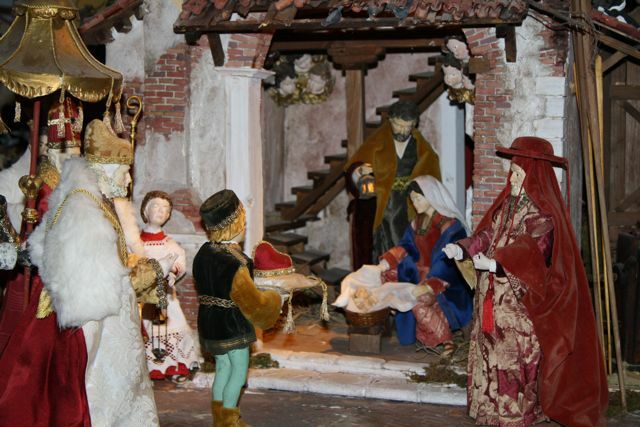 And in those where it is visible to the public before Christmas, Baby Jesus is placed in his crib on December 24th, like in this one in San Lazzaro dei Mendicanti in Castello. 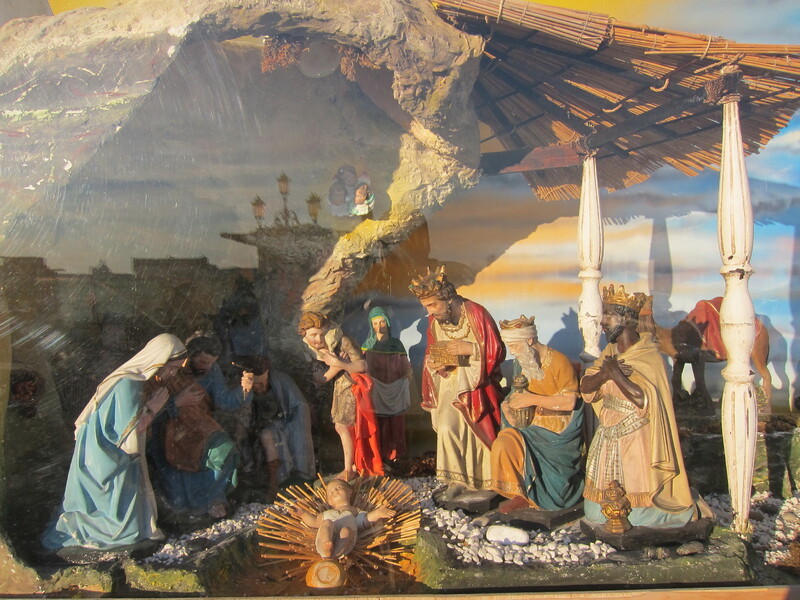 An exception is the presepe on the façade of the church of La Pietà on Riva degli Schiavoni where even the Wise Men pay tribute before Christmas. 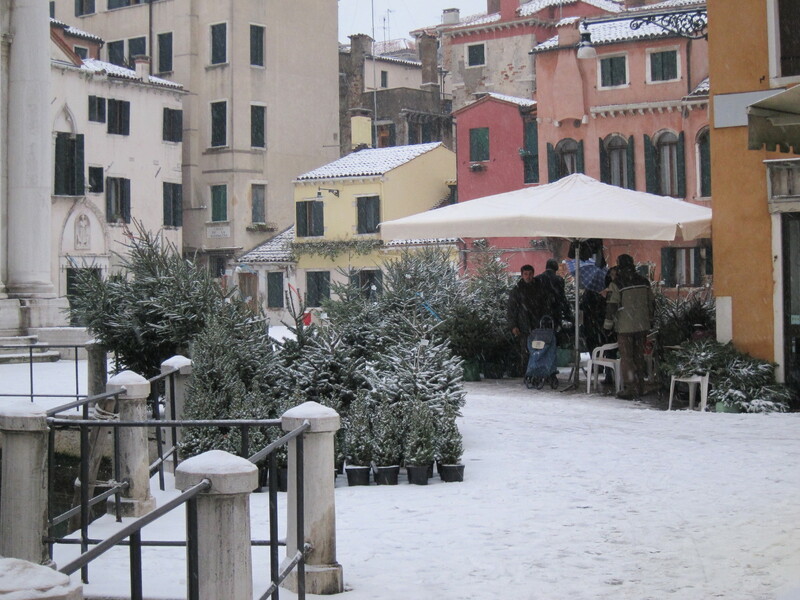 If you are looking for a fresh Christmas tree in Venice, it is likely that you would find it around the Strada Nova, either by Rio de San Felice or by Campo de la Madalena. 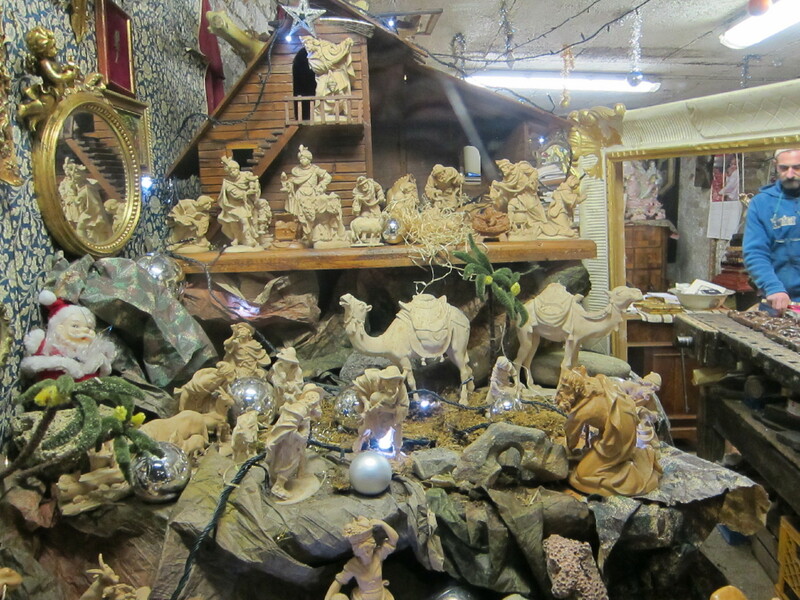 I've also seen them in a flower shop in Campo San Cassan. 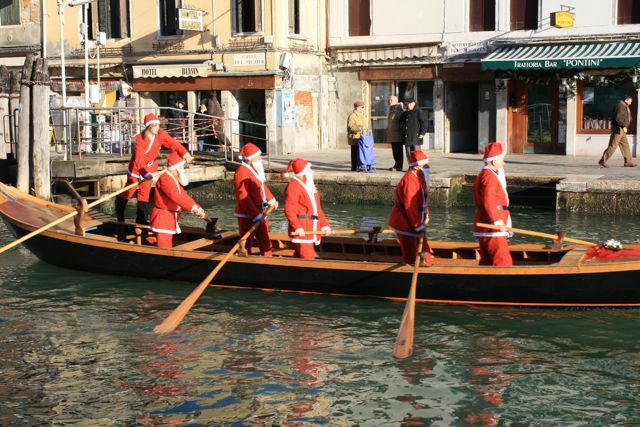 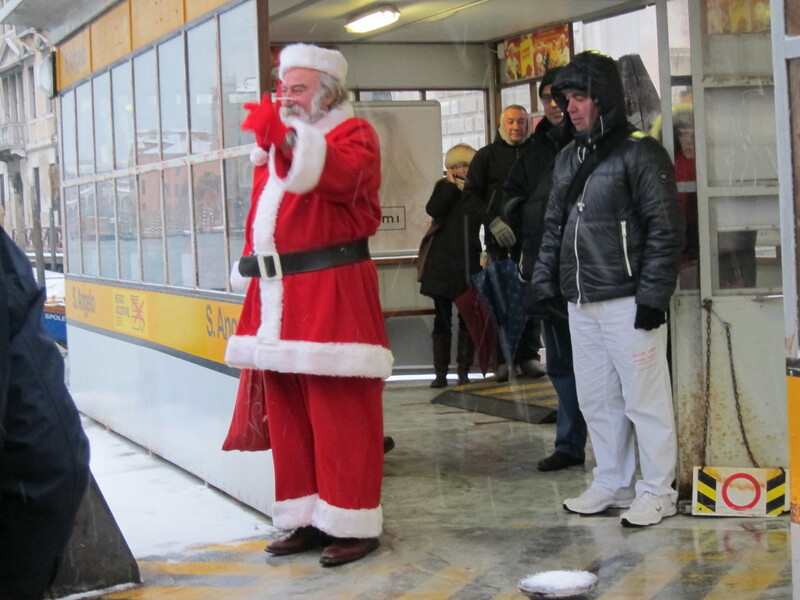 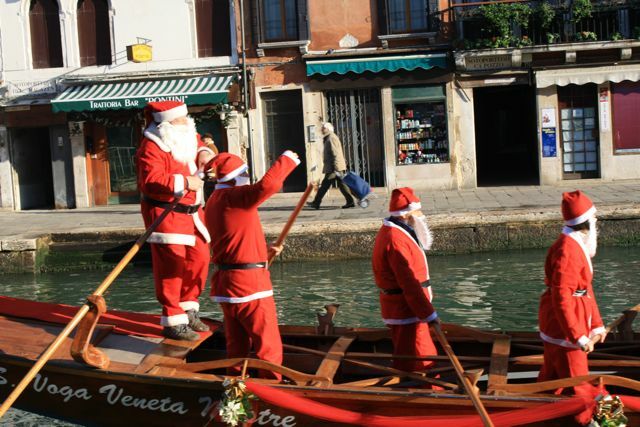 Santa may well be an American recreation of Saint Nicholas but he is popular in Venice too. 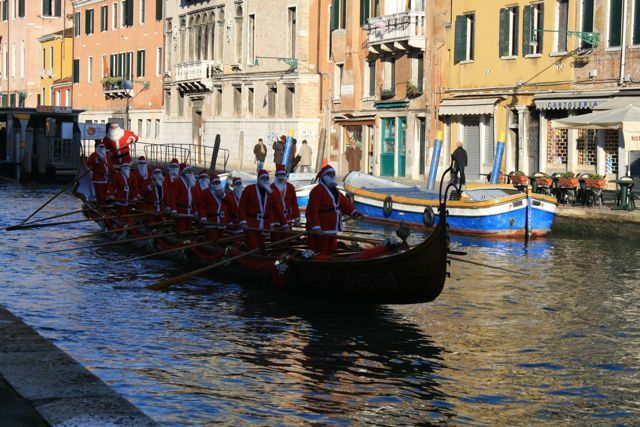 You can say hello to him in a vaporetto fermata, at the Rialto, or while rowing near the Grand Canal. 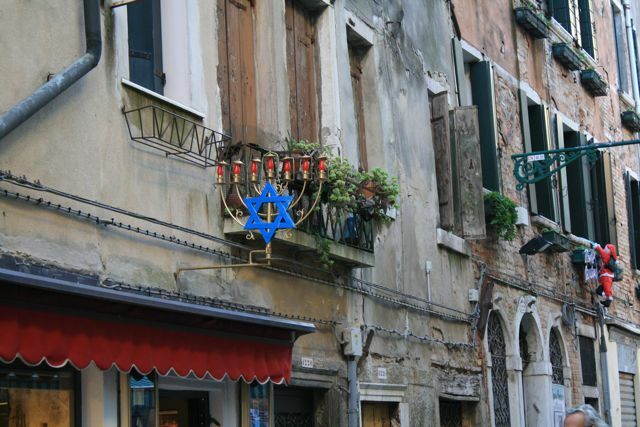 Both Hanukkah and Christmas are celebrated in the Ghetto with the giant menorah in the middle of the campo and the decorations in many of the shops and houses. 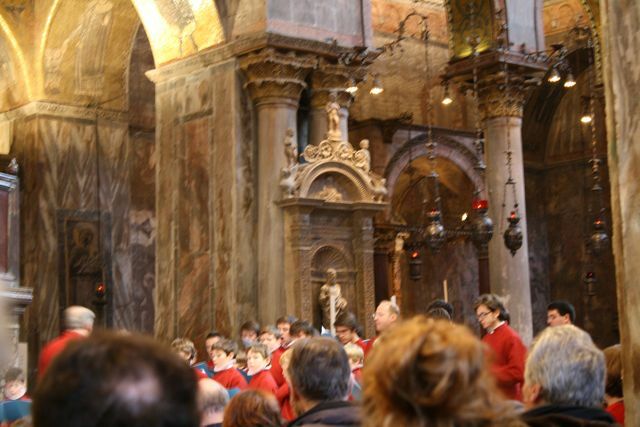 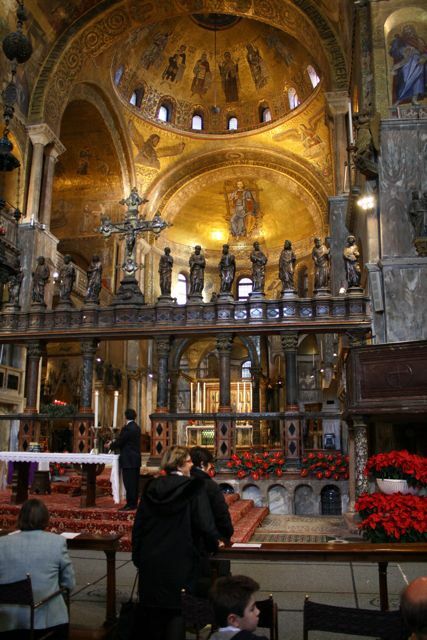 One of the most cherished of all Christmas traditions in Venice is the Concerto di Natale, held at the Basilica every year. 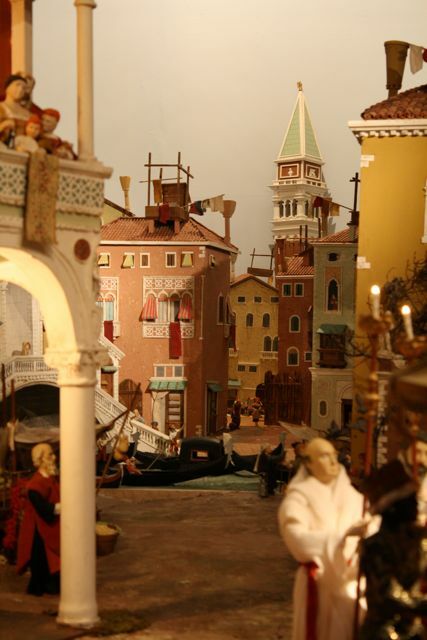 It is a "by-invitation-only" event that just well-connected Venetians and lucky visitors can attend. 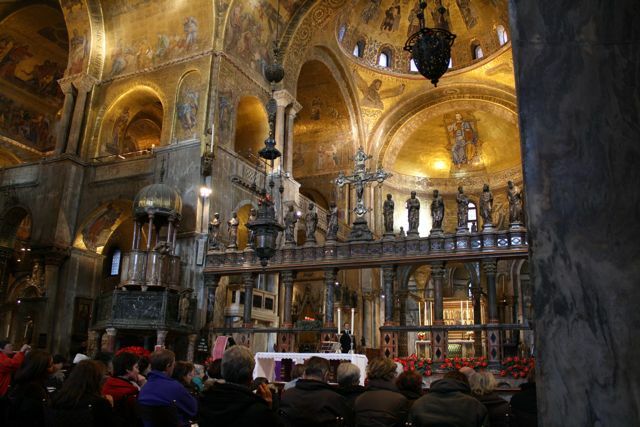 If you don't belong those groups, I recommend you attend the next best thing, a high mass at the Basilica the Sunday before Christmas. 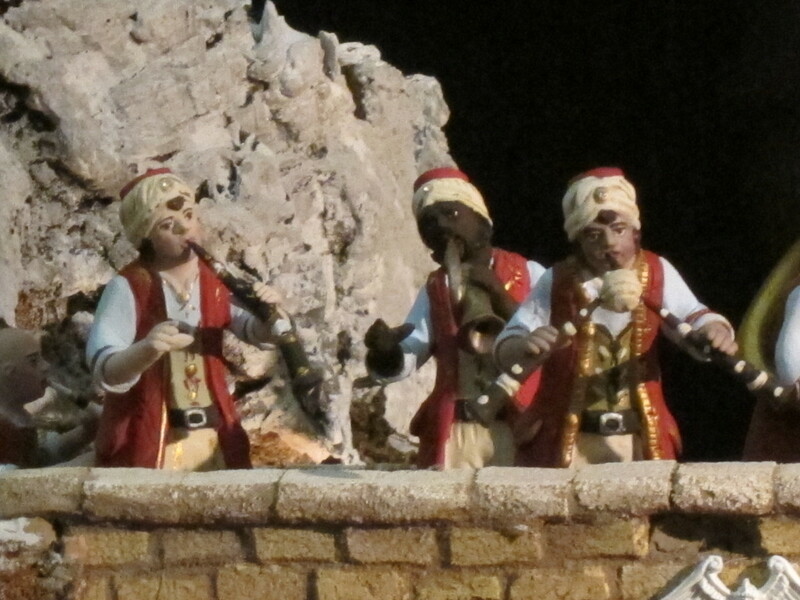 You never know who may be performing. 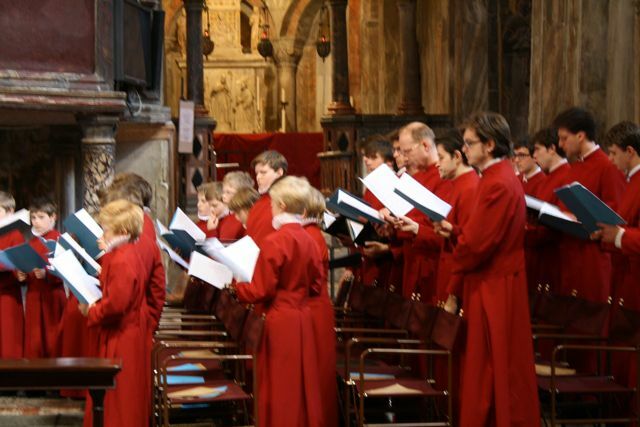 Not too long ago the Oxford College Choir sang a number of beautiful Christmas themes. 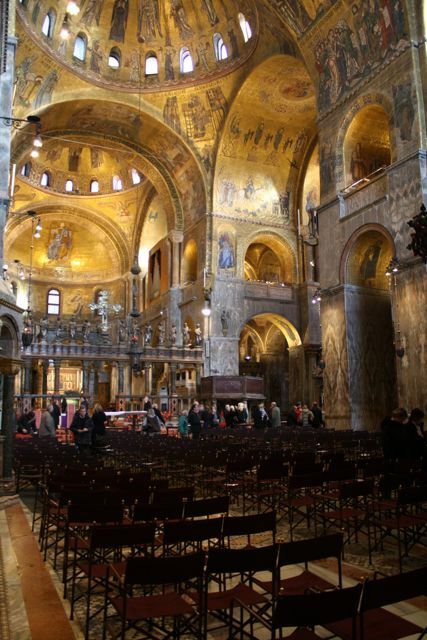 Even if no special performance is scheduled, just hearing mass under the golden light of San Marco is a moving and unforgettable experience. 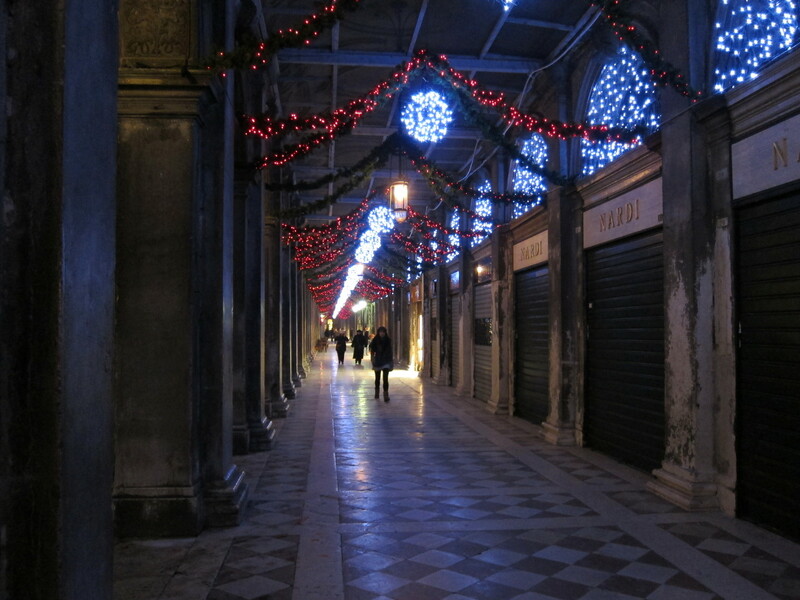 The days leading to Christmas are one of the best times to visit Venice. 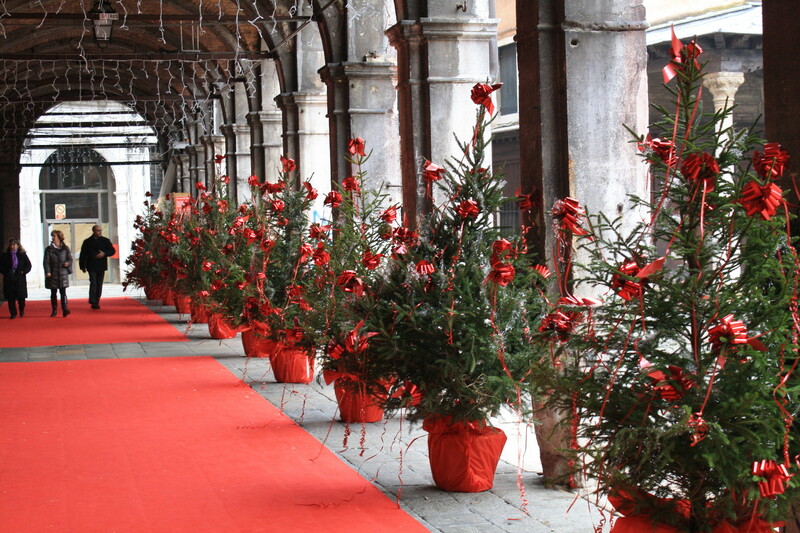 There is a Christmas concert in almost every church, there is mostarda veneta at Drogheria Mascari, the Mercatino dell' Antiquariato is open at Campo San Maurizio, beautiful Nativity scenes can be found all over town, and as an added bonus you will have the city all to yourself, and the Venetians will be more welcoming than ever. 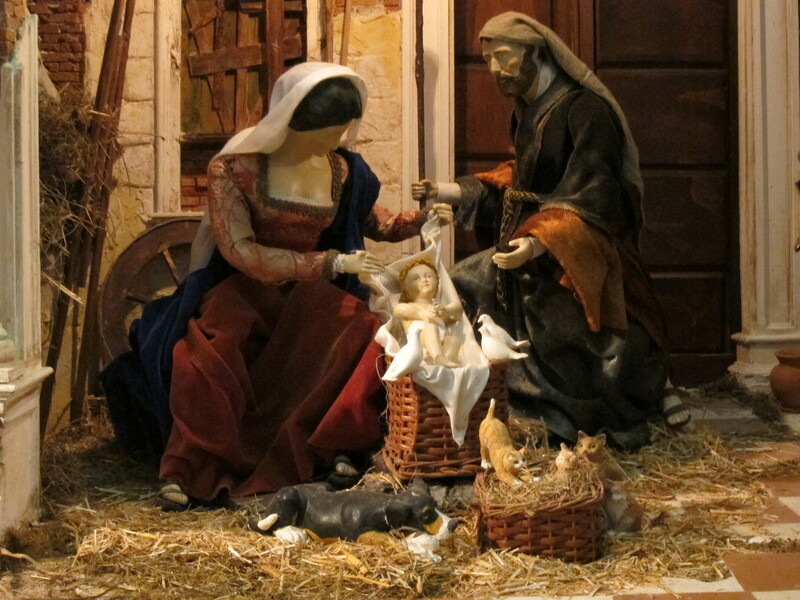 But above all, you'll be connecting with the true essence of Christmas, an intimate and private adventure set forth in peace and good will. 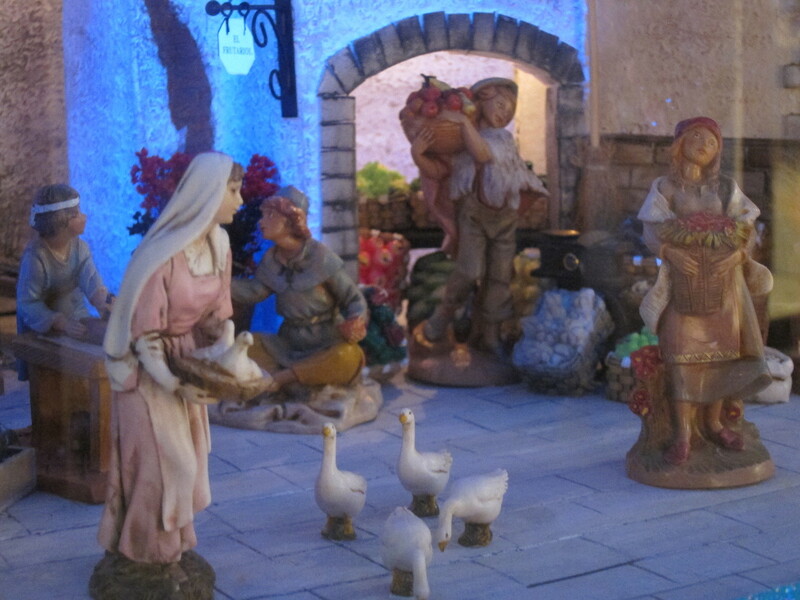 You can watch a great video of Luciano Soleni's presepe on YouTube.